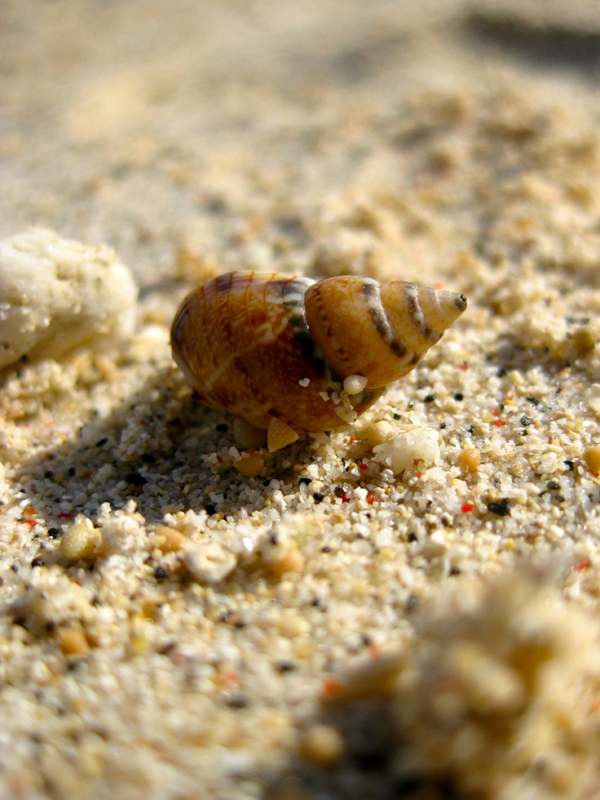 Along the west coast of Lombok are three exceptional small islands, the Gilis. They are quite popular among the tourists, but it is still a bit of a hidden paradise. From Padangbai it's only an hour and a half sailing. Tickets for the boat are available everywhere in the village, hotels however offer a better price. The island that we have chosen, Gili Trawangan, is the most visited, popular and 'developed'. But all three offer exotic beaches and rich underwater world. The trip to Gili Trawangan was pretty adventurous. 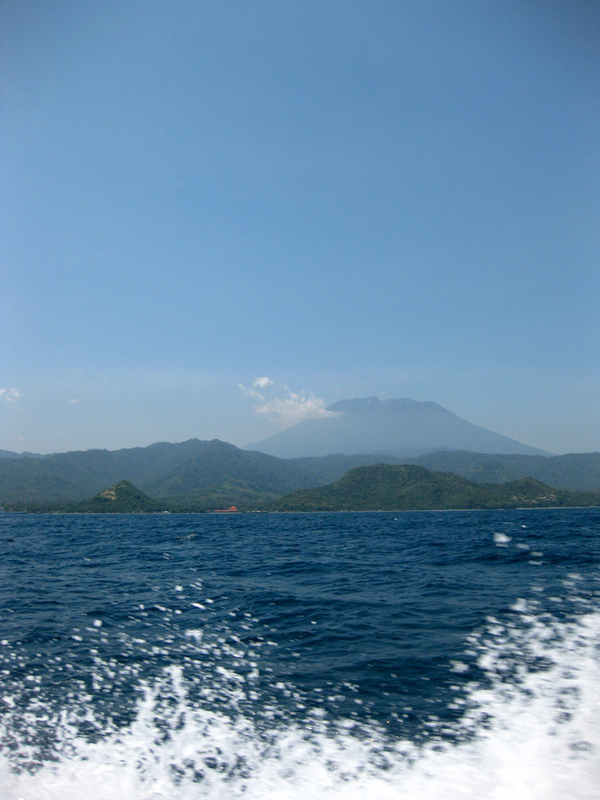 When Bali disappeared behind the horizon, the boat rocked back and forth hugely. Some passengers were seasick and one in particular (he kept going and going...). Boat's motion and sounds of vomiting made this trip heavily. The sight of Lombok mountains and the coast of Trawangan was a huge relief. I was extremely happy to get off that boat. Islands first sight is the white beach, clear water and loads of cement bags on shore. As you enter, the island is less exotic than expected. The only transport here is the horse carriage. We also took one to our hotel. 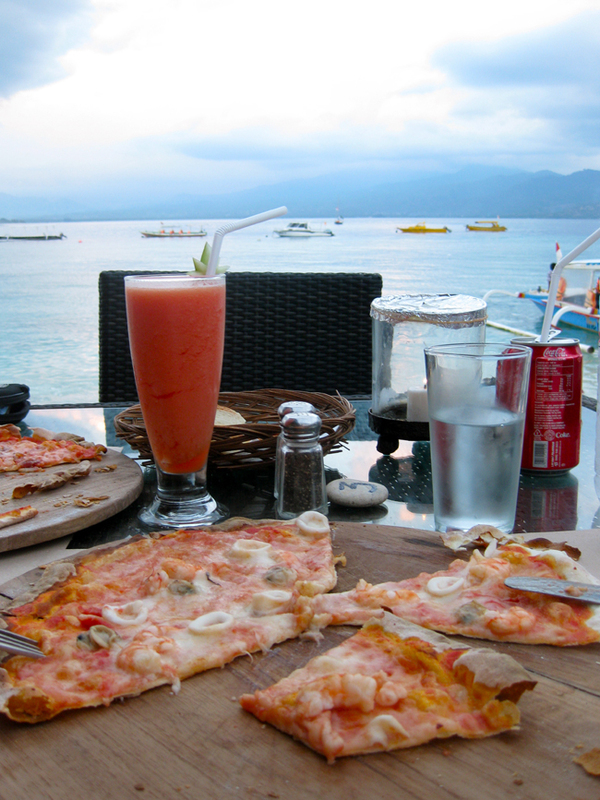 The less attractive is than replaced by the many cafes, diving centers and a very relaxed atmosphere. There's only one road that goes around the island. Near the so-called port it's crowded and lively. Approximately at the location of our hotel the quiet part began. The choice of the hotel is therefore quite easy to make. The location of the hotel says a lot about the activity on the island. Although the most peaceful locations are not always the best. The roads are impassable, the water is full of coral and inaccessible en hotels are still in construction. We were lucky with hotel, it was within walking distance of all restaurants, but without street noise. First day we discovered the neighborhood by walking. Later we rented a bike and went to the best snorkel spot. This place was also the only place where I could swim properly. Almost the entire island is surrounded by coral or pricky dead coral pieces. We also cycled a circle around the island once. That was pretty heavy. The most part of the road is sand. Cycling was impossible. This side is also the least civilized part, without hotels and cafes. The first fruit shop we encountered seemed almost like an oasis. 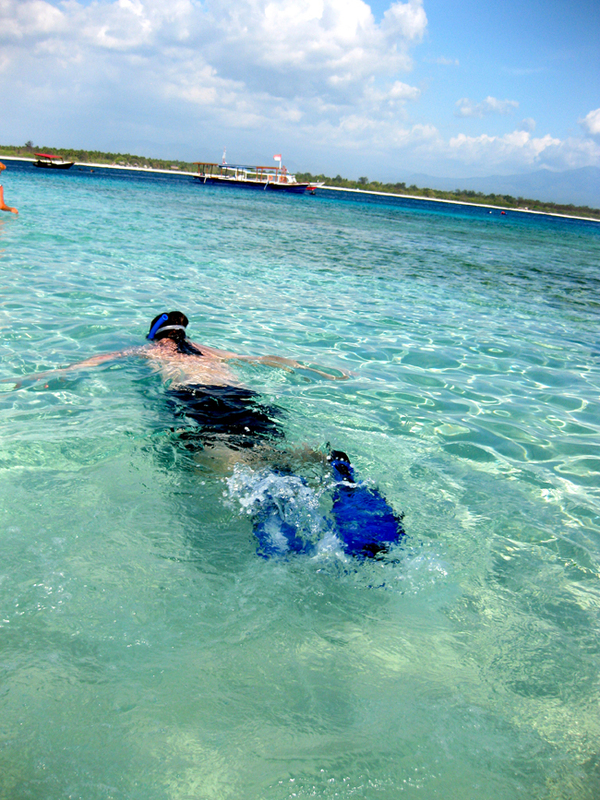 Snorkeling was definitely the best thing Gili Trawangan has to offer. The area is teeming with turtles! Sometimes they are difficult to spot, but usually they swim up and down. It is amazing, I've never seen so much turtles, not even during scuba diving elsewhere. Once I also saw a lobster, squid and a small ray. While enjoying all that beauty in the water the mosque on land provides the 'Allahu Akbar' singing in the background. Not very soothing. But it’s a Muslim island. Except for the sounds of the mosque you will notice little of it. The only thing annoyed me here is ignorance of people. No one seems to know how sensitive the coral is. They touch it, break it off, stand or walk on it. Simply killing it little by little. Nobody cares how precious it is. I can only imagine what is going to happen to this wealth. Bali gave us a pretty frantic trip. Gili Trawangan gave us peace and tan. Time stood still for ten days. It was almost time to travel back home. But first back to Bali, a more pleasant thought.